After years working as a Personal Assistant for a large company, Hayley was hoping to begin a new career which would allow her to become her own boss. She no longer wanted the stress and pressure of working in as part of an organisation and instead, wanted to be able to pick hours that she enjoyed working doing treatments that she loved. After training, Hayley was planning to open a clinic of her own offering prominently Laser Tattoo Removal as this was her main interest. Before being able to continue onto Level 4 Laser Hair Removal and Level 5 Laser Tattoo Removal training, all students must complete and successfully pass their Level 4 NVQ Core of Knowledge training; this is a legal requirement. Each training course begins with a theory-based presentation, which allowed Hayley to start to grasp a basic understanding of the use of lasers, along with factors such as how lasers are used on the body, wavelengths, anatomy of the skin and many more. As all courses at our academy are taught in small groups, all students are given the opportunity to ask as many questions as they feel as if they need to until they are confident with their knowledge. Once Hayley had completed the theory section of each course, she then moved onto practical training. Not only is practical training important to allow students to put their knowledge into practice within the comfort of experts, but also to enable our trainers to assess their skills. To successfully pass all courses, Hayley needed to complete both an end of training exam and her case studies. Exams are carried out at the end of each training course, and case studies can be completed on a later date. Luckily, Hayley passed all of her exams first time with no problems at all and opted for coming back to our academy two weeks later to write up her case studies. This meant that our trainers were able to give extra guidance and answer any questions Hayley had. "I couldn’t thank the Bianco training academy enough for all of the support they gave me both during and after my course. I thoroughly enjoyed taking all the courses, and my trainers were so professional, yet friendly and reassuring, happy to answer every question that I had. 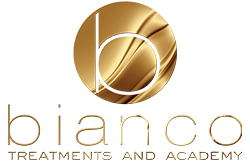 I’m so excited to start this new chapter in my life and begin a career in laser treatment, none of it would be possible without Bianco!"